There is one skill that sets a man apart from all others. Yes, the ability to blend his own Scotch whisky. Here's your chance to up your skills and learn from the pros at DEWAR'S Discovery. These private tastings are designed to enter you into a like-like affair with the taste and quality that defines DEWAR'S Blended Scotch Whisky. Ensuring your eventual mastery, a DEWAR'S ambassador will personally guide you through a sampling of the legendary spirit as you learn about its unique double-aging process and the time-honored craftsmanship that helps it maintain perfect balance. The learning gets higher as you're actually shown how to blend your own whisky -- and you thought making your own pottery was fun. 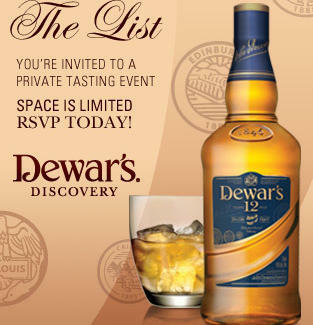 To see the schedule and sign yourself up, visit discovery.dewars.com/Miami. And don't worry --registration is way easier than finding your place in the circle of life. This private event isn't for everyone -- it's for you. Reserve your place at discovery.dewars.com/Miami. ENJOY RESPONSIBLY. ©2010 DEWAR'S. IMPORTED BY JOHN DEWAR & SONS COMPANY, CORAL GABLES, FL.BLENDED SCOTCH WHISKY – 40% ALC. BY VOL.